Windows: Windows looking outwards. Windows looking inwards. Windows of the soul. A window of opportunity. A window into the future. A window into the past. What a great word Marianne has given us this month. http://eastofmalaga.net/2012/10/01/cbbh-photo-challenge-windows/ For me it was yet another nudge to view things differently, to explore the word, rolling it round in my head, looking more imaginatively at the things around me. 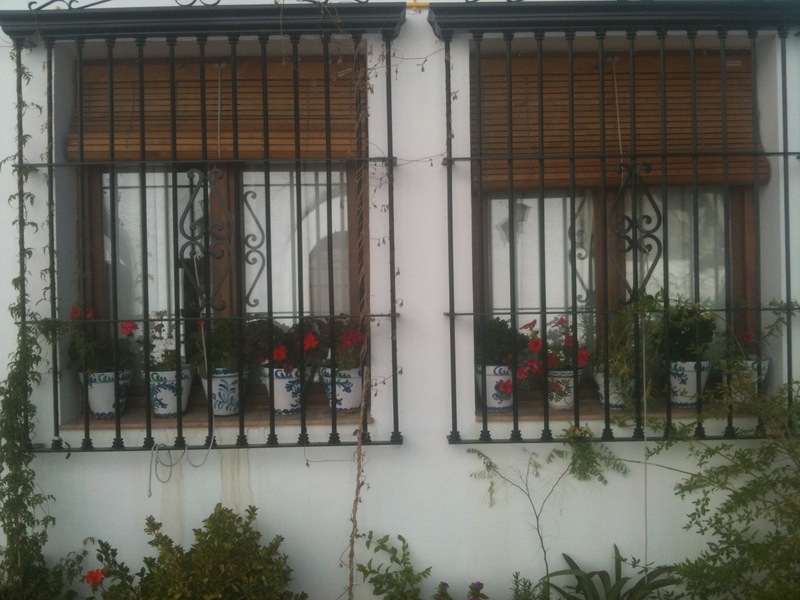 My first submission is a fairly straighforward and typically Spanish pair of windows. Marianne herself may recognise them, as they are located in the courtyard of the wonderful Arab Baths at El Ventorro, near Alhama de Granada. So for me, as well as being simply lovely windows, they are a reminder of a special day with special friends, and a dramatic drive over Ventas de Zafarraya. For the Blog-Hopping, this month I discovered Lynsey Drake’s lovely Axarquían foodie blog at http://larosilla.info/ It combines the perfect word and photo ingredients to make a tempting and mouth-watering blog. For bloggers who care about the words they write, I commend to you Anne Orchard’s blog at http://anneorchardwriter.wordpress.com/ Anne writes about writing, and also enters a number of photo challenges too, so her blog is a lively mix with something for everyone! So looking again for windows – closer to home than the first picture, both geographically and emotionally, is my own kitchen window. 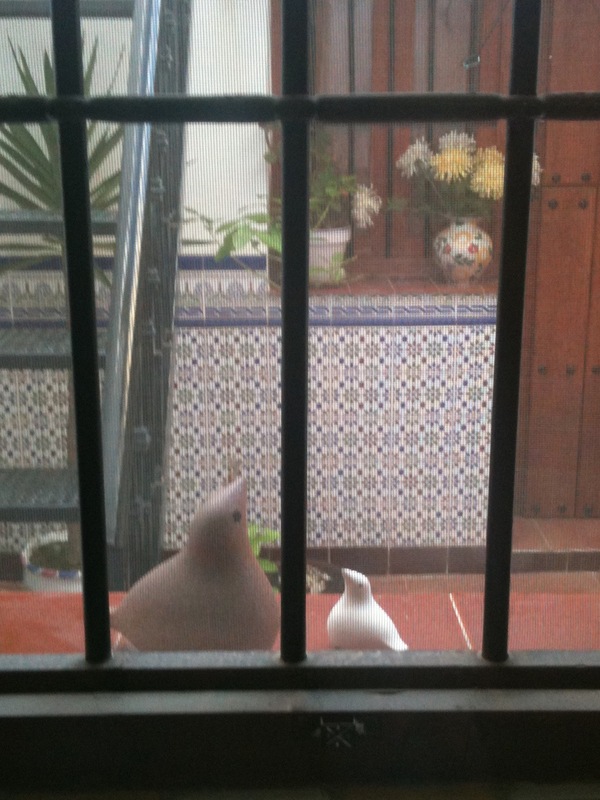 I was gazing out of it while washing up, and wondering where I could go to take this month’s CBBH photo challenge pictures, when I noticed how lovely the two doves looked from the inside of the window. They were made by my friend Ann Wilson, a talented potter, and they mean a lot to me. My final picture is the one that explores the more symbolic aspects of the word “windows”. The sunset above La Ermita at the top of Colmenar on a cloudy evening painted an unusual burnished bronze effect on the doors. 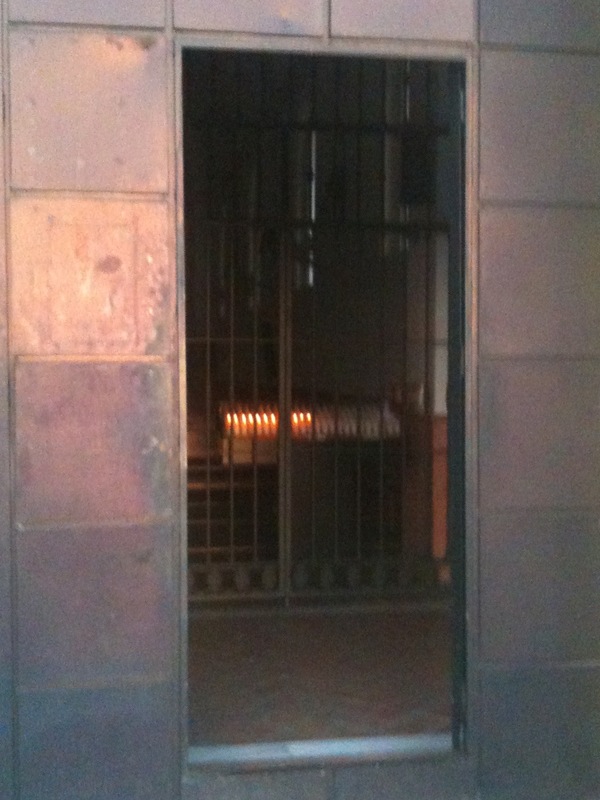 Seeing the votive candles through the doorway offered a window into the suffering of those who had lit them. A relative in hospital? Someone awaiting test results? The anniversary of a long-ago loss? As I stood there, a Spanish lady, not elderly, dropped her offering into the box and another candle flickered into life. Her mouth was tight, she was holding in her emotions. Then she left. It felt as though she had been before – was this a nightly ritual? I waited a moment to allow her to get ahead of me before I headed back down the hill, aware I had glimpsed her sorrow through a momentary window as our paths crossed at the church door. This entry was posted in Conejo Blanco Blog Hopper, Spain and tagged Andalucia, Axarquía, Colmenar, Conejo Blanco BlogHopper, windows by tamaraessex. Bookmark the permalink. I´m so glad you enjoyed your visit to El Ventorro, Tamara – I just knew you would! You have given us a lovely selection of windows to consider in your post this month – thank you.